This making of a TV-ad shows a young woman holding an electric drill. She is supposed to talk directly to the camera. During the c. 25 repetitions of quoting the advertisement slogan, she laughs, breaks up, swears and gets into a routine. For a moment we see the well-known TV ad aestetic, but a short moment later the situation shifts back into the reality of the shooting. The video should be shown on a television set, preferably placed in a crowded area, like in an entrance or exit of a building or exhibition. 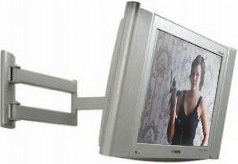 The TV can be put on a pedestal at eye-level or, if possible, installed with a tv-arm on the wall.